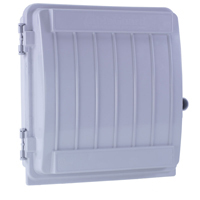 The CableGuard CG1500 enclosure can be used to mount a CMB24D controller and DC Power Supply. Enclosure is included with the WowLights RGB Controller. Constructed of a weather-resistant/high impact thermoplastic alloy, the hinged cover design allows easy access while the self-sealing individual entrance ports prevent water and insects from entering. The organized mounting arrangements not only create a standardized method for mounting.